How can I manage CBB on my farm? Come and join us for a coffee pruning demonstration by Gary Strawn. 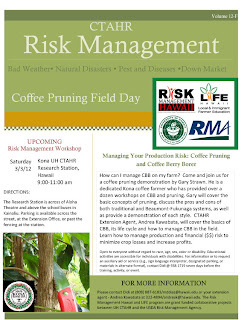 He is a dedicated Kona coffee farmer who has provided over a dozen workshops on CBB and pruning. Gary will cover the basic concepts of pruning, discuss the pros and cons of both traditional and Beaumont-Fukunaga systems, as well as provide a demonstration of each style. 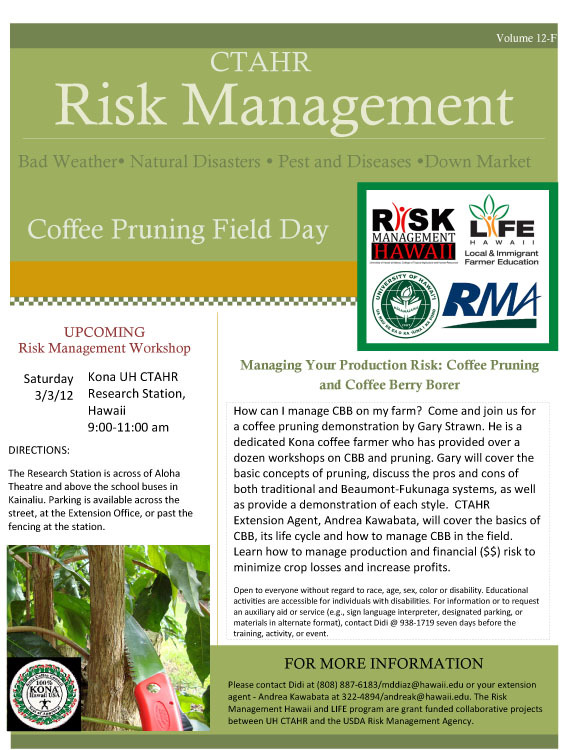 CTAHR Extension Agent, Andrea Kawabata, will cover the basics of CBB, its life cycle and how to manage CBB in the field. Learn how to manage production and financial ($$) risk to minimize crop losses and increase profits. The Research Station is across of Aloha Theatre and above the school buses in Kainaliu. Parking is available across the street, at the Extension Office, or past the fencing at the station.